If a contact wants to resign or cancel their membership, rather than deleting their membership, you should change the status to cancelled or another status that is not considered current. This ensures that you keep a historical record on the contact's interaction with your organization and all contribution records attached to that membership. Similarly, if a contact's membership was in grace period and you knew that they were not going to be continuing their membership for another period, you could manually change their membership status to expired as opposed to cancelled since they went through the entire period of their membership. Search for a particular contact whose membership status you would like to change, click on the Membership tab then click Edit next to the membership record. Keep in mind that manually expiring memberships may not be needed. 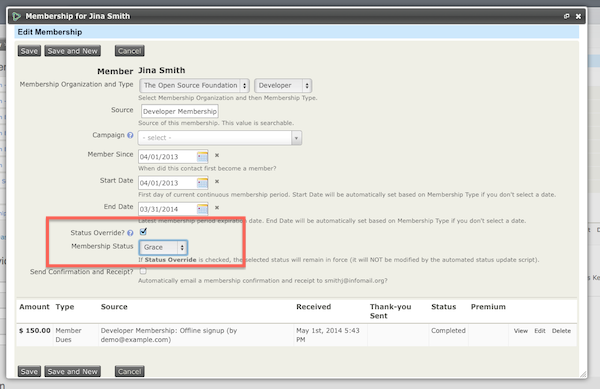 Dependent upon how you have your membership status rules setup within Administer > CiviMember > Membership Status Rules memberships will automatically expire based on timeline criteria. The only time you would want to delete a membership is if you entered it error, for example if you made Jo Smith a member instead of Joe Smith, you would want to remove the incorrect membership and any linked contribution record for Jo Smith. When a membership is deleted it is completely removed from the database and so are any linked contributions. This action cannot be undone so you should only give permission to delete memberships to trusted staff. Click on Memberships > Find Members > enter your criteria and from the "Find Members" results screen, select the membership records and click Delete.